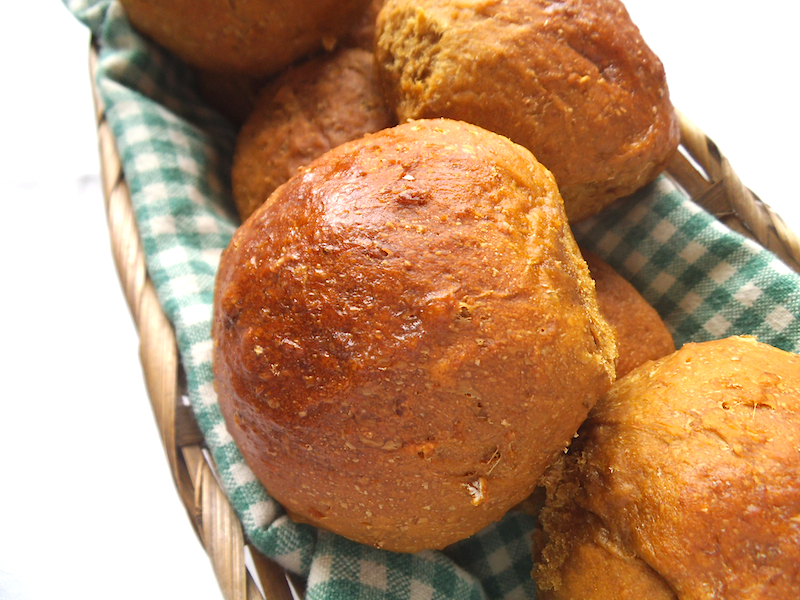 Molasses adds a distinctive deep flavour and rich colour to these fresh buns based on traditional east coast brown bread. I asked a very good friend of mine from New Brunswick what typical maritime food is like. Besides the obvious seafood specialties, freshly baked brown bread, she told me, was a staple that you would find quite often on the table. And the inclusion of molasses in the bread and as a topping could not be stressed enough. In fact, if she mentions to her father that she or someone in her family is tired or unwell, he makes a point of asking whether she is getting enough molasses. 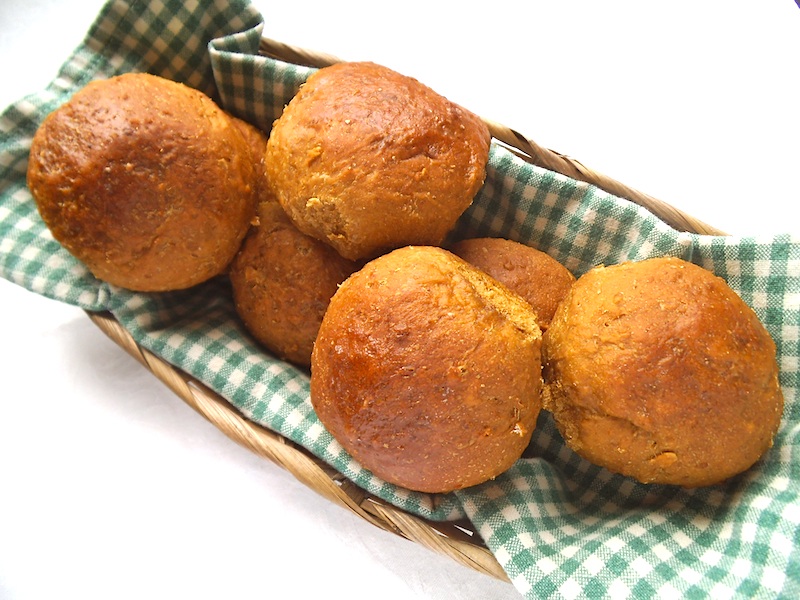 Rich in iron, molasses is a healthy choice to sweeten bread. And the darker the molasses, the more minerals it contains. In Canadian grocery aisles, there are two types of molasses commonly available. “Fancy molasses” is lighter and sweeter than “cooking molasses,” which has a stronger flavour and is richer in iron and calcium. In the U.S., there are three grades of molasses–light, dark, and blackstrap, the third option being the most intensely flavoured and nutrient-dense. 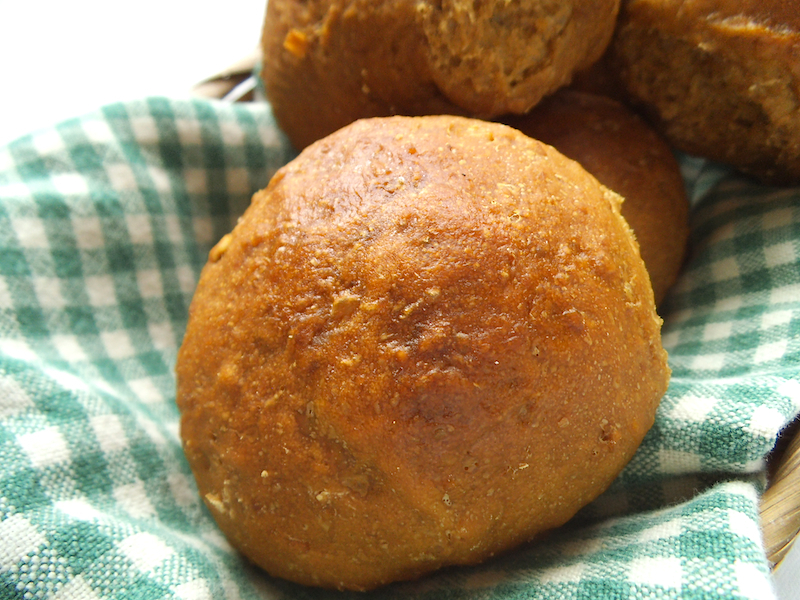 These brown bread buns have a rich molasses taste that will pair well with barbeque flavours and/or seafood. Or you can slice them and make delicious sandwiches for lunch on-the-go. They taste amazing with cream cheese (dairy or non-dairy); I plan to use these buns to make delicious cream cheese and cucumber sandwiches for lunch this week! Add boiling water to oats in a 2-cup bowl. In a large mixing bowl, dissolve yeast in 1/2 cup lukewarm water. Add molasses and or oil to oats. Stir in salt, followed by maple syrup. When oats are no longer hot but have cooled to lukewarm, add to the dissolved yeast. Stir in flour, one cup at a time. Knead for about 10 minutes, until dough is smooth. Gradually add small amounts of extra flour if necessary, so that the dough is soft but not sticky. 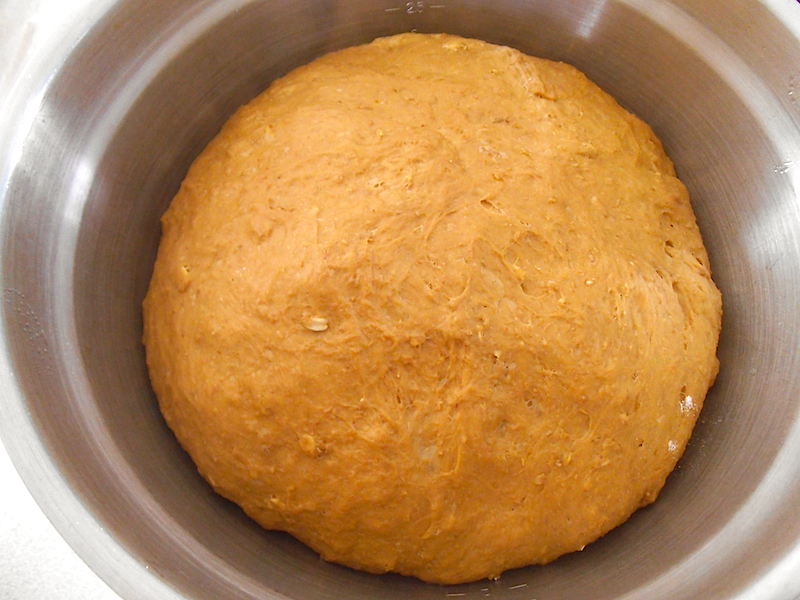 Place dough in a large greased bowl. Cover bowl loosely and let rise until double, about 60 minutes. Punch down dough and divide into 18 equal pieces. Form pieces into round buns and place on a greased cookie sheet. Cover loosely with greased plastic wrap or a damp tea towel. Let rise for 45 minutes or until doubled. Preheat oven to 350 degrees F (180 C). Uncover dough and bake buns for 20-24 minutes or until medium brown. Remove buns from oven and allow to cool on the tray for 10 minutes. Serve warm with butter, or slice in half horizontally for sandwich buns. Sorry, it’s not quite ready. I thought I’d filed it as draft. Hopefully you’ll see the recipe here tomorrow! I hope you enjoy them, Carlee! Molasses is good stuff! I usually just add a tablespoon to my regular bread recipe. But more is better when it comes to making authentic brown bread! I’ve never tried molasses in bread before but can imagine how wonderful it must taste! Can’t wait to try that next time!